Code 3, 2100 LED Lightbar, 12 LED Modules, takedowns, alley lights, lots of cable, Price $500. Colors available: blue/blue with blue top covers. Whelen Liberty LFL LED Lightbars, Economy version with 8 LED Modules=4 to the front (2 corners and 2 inners) and 4 to the rear (2 corners and 2 inners-your choice of blue or amber on the inner LED modules). 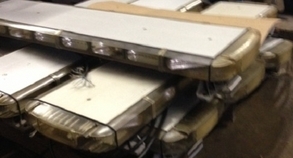 These lightbars also include takedowns and alley lights (halogen) which also have the flash option. The cables are long and the lenses are polished prior to shipping. Blow out price of $400! Whelen Liberty LFL LED Lightbars, 14 LED Modules, takedowns, alley lights (both halogen), and have long cables. The 6 center rear amber LED modules are the rear traffic advisor that require a control box to operate. These lightbars are available in blue with the amber traffic advisor. Price is $400 not including the traffic advisor control box. Federal Signal Arjent LED Lightbar, with amber traffic advisor, Price $400, colors available: red/red, blue/blue, or red/blue.